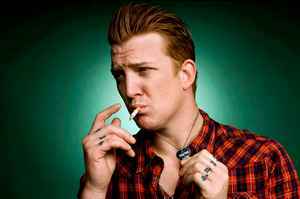 Songwriter/guitarist Josh Homme has been part of two of the most acclaimed stoner rock/metal bands of the late '90s, early 2000s: Kyuss and Queens of the Stone Age. Formed in the late '80s, Kyuss hailed from Palm Desert, CA, and built a following by throwing "generator parties" (which consisted of inviting friends out to a secluded part of the desert at night while the band would plug into a power generator and jam away until dawn). The band's 1991 debut, Wretch, was ignored by the public (despite such similar-sounding acts as Soundgarden and Alice in Chains storming the charts), and while 1992's Blues for the Red Sun received widespread critical acclaim, it, too, failed to break the band commercially. Kyuss signed with Elektra, issuing two more releases (1994's and 1995's ) before calling it quits in 1995. Let down by Kyuss' breakup, Homme didn't touch his guitar for nearly a year, but decided to get back into music when Screaming Trees invited him to serve as the band's second guitarist on select tour dates in support of their 1996 release, Dust. This led to cameos on recordings by other artists (Gamma Ray , Wellwater Conspiracy, and Mike Johnson), as well as starting up the multi-volume series, The Desert Sessions, which featured former members of Soundgarden, Monster Magnet, and Kyuss indulging in tripped-out jams. All the guest spots had rekindled Homme's desire to form another full-time band, and by the late '90s he was ready to take the plunge again. Homme hooked up with former Kyuss/Dwarves bassist Nick Oliveri to form Queens of the Stone Age, a band who tempered Kyuss' monolithic rock with more varied styles and focused songwriting. The pair would be joined by a revolving door of other members (with both Homme and Oliveri sharing vocal duties), and by 1998, QOTSA were signed to Stone Gossard's Loose Groove label, issuing their self-titled debut the same year. 2000 saw the release of their sophomore effort (and first for the Interscope label), , which became one of the year's most critically praised rock releases, as the band toured with such big names as Hole, Foo Fighters, and The Smashing Pumpkins (as well as being part of Ozzfest 2000 and the 3rd Rock in Rio). Baby Duck, Homme, Homme, Josh, J Ho, J Ho The Circus Monkey, J Homme, J. Ho, J. Homme, J.Homme, JH, Josh, Josh "Baby Duck" Homme, Josh "The Other White Meat" H., Josh "Yeah? What?" Homm, Josh A.k.a. Carlo, Josh/Carlo, Joshua, Joshua "Baby Duck" Homme, Joshua H, Joshua Homme, Joshua The Mildly Entertaining, Poshua H, Poshua H.